It’s a known fact that Germans love food. 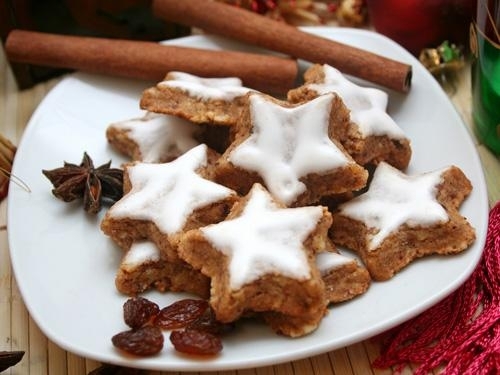 Especially in Winter we indulge in backing “Plätzchen”, Christmas cookies. There are SO many varieties but I have decided to show you how to make one of the absolute classics, Zimtsterne. They are soft yet a little hard cinnamon biscuits with a meringue topping. Roast the nuts in an pan without oil and let cool. Beat Egg whites, lemon juice and a pinch of salt until stiff. Gradually add sugar and continue to whisk until it has dissolved. Keep 3 tablespoons of beaten egg whites for the icing later on. Stir the Vanilla sugar, cinnamon, nuts and 100 g of almonds into the backing mixture. Cover it up and put it somewhere cold for about 2 hours. Roll out the mixture about 3 / 4 inch thick on a surface dusted with sugar. With a star cookie cutter dipped in sugar cut out little stars and put them on a backing tray covered with baking paper. Mix the egg white icing with a few drops of water and ice the stars. Bake in a preheated oven at 150 ° C (gas 1, convection 10-12 minutes at 140 °C) for 15-18 minutes on the bottom rail. Remove the stars from the backing paper and let them cool. Sprinkle with cinnamon to taste. Previous Hello world! Next Vienna in a nutshell.